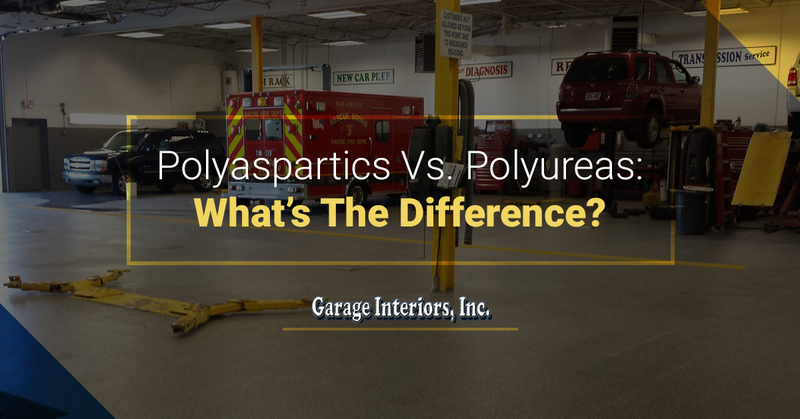 Garage Floor Coating Wisconsin - Polyaspartics Vs. Polyureas: What’s The Difference?Garage Interiors, Inc.
Polyaspartics Vs. Polyureas: What’s The Difference? There are many different types of garage floor coatings available today, from traditional epoxy garage flooring and garage floor paint to more advanced materials, like polyurea coatings and polyaspartic floor coating. Not many homeowners know the difference between these kinds of garage flooring, especially polyureas and polyaspartics, so we’re dedicating this blog post to the main advantages and drawbacks of these two not-so-synonymous garage flooring types. At Garage Interiors, we’ve installed hundreds of polyaspartic garage floors in both residential and commercial garages throughout Brookfield, Menomonee, Franklin, and other parts of Southeast Wisconsin, as well as parts of Northern Illinois. We’ve chosen polyaspartic as our preferred garage floor coating material for many reasons, including the following. Deeply penetrating — polyaspartic penetrates concrete by ⅛ of an inch, compared to other garage floor coatings, which rest on the top. 24-hour cure time — polyaspartic flooring cures five times faster than epoxy, but it takes about the same time to cure as many polyureas. UV-resistant — polyaspartics are non-yellowing and do not fade or peel with sun exposure. UV-stable — polyaspartics are aliphatic compounds (do not yellow in the sun), and they do not emit any volatile organic compounds once cured. Stain-resistant — the protective layer of polyaspartic flooring resists stains and is easy to clean. Polyurea coatings are commonly mistaken for polyaspartic flooring, perhaps because polyaspartic, polyurea, and polyurethane all sound very much the same. However, there is one major difference between polyaspartic flooring and polyurea coatings: polyureas are not aliphatic, meaning that they are not UV-stable. This means that polyureas are not resistant to yellowing or turning an amber color when exposed to the sun for extended periods of time, which make them susceptible to degradation in many garages. Still, polyureas are a better choice than epoxy garage flooring, as they are more resistant to scratches, oil spills, and other common occurrences in both residential and commercial garages. However, they do not offer the same UV-resistance or durability as polyaspartic flooring does, as they tend to degrade quicker if exposed to sunlight (as most garage floors are). That being said, if you want to get the most bang for your buck when you have a new garage floor coating installed, make sure all your bases are covered by opting for polyaspartic, rather than polyureas. Now that you know they key difference between polyaspartics and polyureas, it’s time to make a decision about which garage flooring type to use in your commercial or residential space. Click here to learn more about our polyaspartic floor coatings, and contact Garage Interiors for a fresh garage floor coating in Pleasant Prairie, Waukesha, Grayslake, or any of the surrounding areas. We look forward to treating your garage floor!